After three long weeks of hearings and debates, spectators burst out into screams and applause Tuesday night after the Senate Judiciary Committee approved an immigration bill that would be the biggest overhaul to the nation's immigration laws in a generation. The bill was produced by a bipartisan group of senators known as the Gang of Eight. With four of those members on the committee, the bill survived 212 amendments over five lengthy hearings. Left intact was the core of the bill, which will allow the nation's 11 million unauthorized immigrants to apply for U.S. citizenship, add significant investments in border security and fundamentally alter the legal immigration system of the future. Some Republicans warned that the amendment process had done little to assuage their fears that they were facing a repeat of 1986, when Congress last passed a sweeping immigration bill that allowed up to 3 million people to gain citizenship, but did not fulfill its promises of fully securing the nation's borders. "Today, we're right back at the same place talking about the same problems and proposing the same solutions," said Sen. Chuck Grassley, R-Iowa, and the ranking member of the committee. Some of the flaws allow Employers to give jobs to immigrants without having to worry about the health insurance mandate as they do with citizens. The response to Grassley in a nut shell, yes it's a flaw...WE'll take care of it LATER! WHERE have we heard that before? You have to listen to Grassley's concerns and the BOGUS answer Durbin gives as he gets all flustered. WHO do you think they'll hire with that choice? Yes, very good video. Scary too. It's passed the albeit easiest 1st hurdle. I've just assumed it would fail (the bill that is), but there is a legit shot imm reform may actually occur. Hopefully the bill will get nowhere. 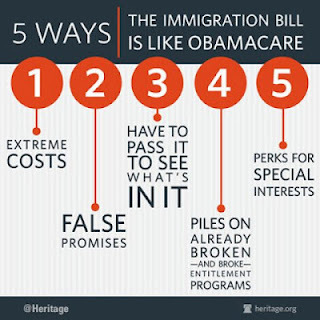 Any Republican in Congress who votes for any type of amnesty bill is signing his political death warrant. That's why the 2007 amnesty bill was defeated, and why it will be defeated again this time around. They may not realize it yet, but Rubio, Paul, Ryan and others who now support amnesty after PROMISING TO OPPOSE IT when they ran for office, will, in the not too distant future, pay a heavy price at the ballot box for their brazen duplicity and dishonesty. Senate Judiciary Committee report on the immigration bill. If your a typical conservative and have trouble with reading comprehension, have a liberal high school student explain it to you.